Many people are defficient in iodine which is a key nutrient found is almost all body organs and tissue. 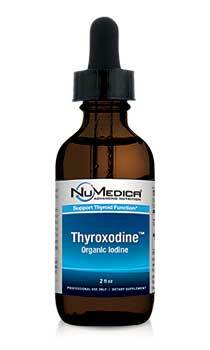 NuMedica Thyroxodine provides liquid organic iodine which helps with thyroid function and metabolism. Iodine is converted into iodide in the body. It is essential to thyroid function and is an integral part of thyroxine. Iodine plays an important part in the production of energy. It also promotes growth, stimulates the metabolic rate, and aids in burning excess fat. Mental processes, speech, the condition of the hair, nails, and skin depend on this mineral and the normal functioning of the thyroid gland. Iodine is easily absorbed from the GI tract and transported via the bloodstream to the thyroid. The thyroid absorbs about 30% of ingested Iodine, and the rest is readily excreted in the urine. Iodine deficiency may lead to hardening of the arteries, slowed mental ability, rapid pulse, dry hair, heart palpitation, nervousness, irritability, and restlessness. Directions: Take five drops in water or under the tongue or as directed by your healthcare practitioner. Other Ingredients: Glycerin, sea dulse, alfalfa and distilled water.